My clients ask me all the time about what to eat while traveling. We all know that eating right while traveling can be tough, but it can be done! If you are traveling by car, my advice is to take a cooler packed with good food choices. Take the time to meal prep before you hit the road, it will keep you from buying that bag of chips or candy bar at the gas station when you fill up. If you are traveling by plane, here is a list of items that I will either take with me or can find at the airport…..
-You can purchase raw almonds and cashews from the airport store. Be sure to grab a bottle of water too, hydration is key when flying. -You typically can find a salad with chicken breast on the menu at airport restaurants. Do your best to make healthy food choices when ordering off a menu. -I am not a huge fan of protein bars, but when I fly I go with Kind bars. At least I can pronounce all the ingredients on the label. -If you are in vacation mode and are looking for a cocktail not so high in calories, go for a vodka and soda water. 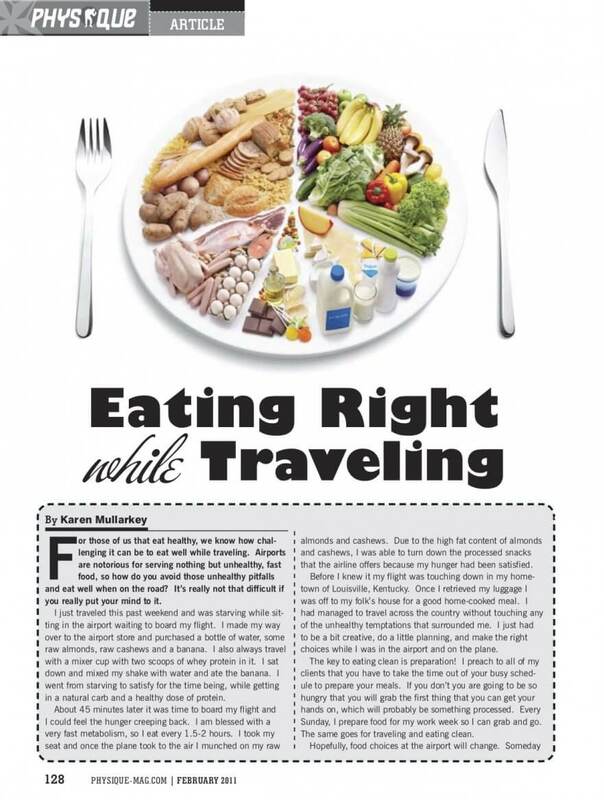 If you would like some more tips be sure and check out the article I wrote in regards to Eating Right while Traveling, which is previewed as the cover image. For future nutrition and fitness tips, be sure and sign up for my FREE weekly blog post!